Pharmacogenomics aims to study the relationship between an individual’s genotype and drug response. Matching the right drug with the right patient does not only increase the treatment success, but also saves the patient from unpleasant side-effects of suboptimal treatments. For delivering personalised treatments, we use as models cancer cell lines in large-scale pharmacological screens and their genomic profiles (Garnett et al Nature, 2012; Barretina et al Nature, 2012; Iorio et al Cell, 2016; Seashore-Ludlow et al Cancer Discovery, 2015). These studies enable the identification of genes that separate patients into responders versus non-responders that are commonly known as biomarkers of drug response. Identifying biomarkers is a statistically challenging task and we focus on the development of novel methods. For example, we developed machine learning methods that do not only leverage the genomic aspect, but also the chemistry of drugs to predict the drug response (Menden et al PLoS One, 2013, Yang et al Scientific Reports, 2018). A main challenge is that the number of samples is relatively small when compared to the number of genetic features to consider. We, thus, develop and apply various methods that leverage mechanistic knowledge of the underlying signaling pathways and regulatory modules to limit the number of features (Schubert et al Nature Communications, 2018, Garcia-Alonso et al Cancer Research, 2018). The lower number of features increases statistical power and at the same time provides understandable and actionable biomarkers (Iorio et al Cell, 2016). We also study the aspect of drug repositioning, which enables the in silico identification of compounds that were not necessarily studied in the context of cancer yet (Iorio et al Drug Discovery Today, 2012) and the quick delivery of novel treatments to patients. We use matrix factorization to generalize from individual drugs and genes and explore the interactions between the drug targets and signaling pathways’ activation, thereby providing robust and mechanistically interpretable insights (Yang et al Scientific Reports, 2018). A typical insight would be: “Activation of pathway Y confers sensitivity to a drug targeting protein X”. These interactions can guide a tissue-specific combination treatment strategy, for example suggesting to modulate a certain pathway to maximize the drug response for a given tissue. Such an analysis of interactions across tissues might help target discovery, drug repurposing and patient stratification strategies. Macau factorization model: (A) The drug response (IC50) is computed by 2 latent matrices. Each of them is being sampled by a Gibbs sampler. In presence of additional information (side information), the latent matrix is predicted by a multiplication of a link matrix and the side information matrix. Arrows in this figure indicate the matrix multiplication. (B) By multiplying the 2 link matrices, we obtain the interaction matrix, which is the interaction between the features of the drugs with the features of the cell lines. Targeted therapies and personalised treatments are the most promising assets to treat cancer. However, in many patients, a tumor’s innate or acquired resistance to a given therapy will render the treatment ineffective. To increase therapeutic options and to overcome drug resistance, cancer researchers have been actively investigating drug combinations. The rationale is that by targeting multiple mechanisms simultaneously, the potency of the treatment is increased and tumor cells are less likely to develop resistance and become refractory to treatment. We are involved in an evaluation of computational approaches to predict drug combinations in the context of the DREAM challenges (Menden et al. bioRxiv, 2018). Pharmacogenomics is based on (A) pharmacological screens of cell lines and (B) their deep molecular characterisation. (C) Both different data sources enable the identification of sensitivity biomarkers, e.g. a cancer somatic mutation might render cell lines sensitive to treatment X. (D) Shows a computational approach, which additionally to the deep molecular characterisation of cell lines, also considers the chemistry of the compounds [adapted from Menden et al. PLoS One, 2013]. (E) Using a microfluidic platform, we can screen cells derived from tumor samples resected from patients. Cells are co-encapsulated along with single drugs and drug combinations and resulting data are used to analyze drug interactions (Eduati et al. Nature Communications, 2018). State of the art screening technologies allow high-throughput screening of a large panel of drugs and cell lines but they cannot be applied to primary tumor freshly resected from patients, mainly due to the limited amount of malignant cells that can be recovered from a biopsy or a resection. For these reasons, we are collaborating with Christoph Merten at EMBL to develop a droplet-based microfluidics platform to perform combinatorial drug perturbation screening on patient samples. The main advantages of using microfluidics are that: 1. it allows to perform automatic combinatorial drug screening experiments with low amount of reagents and 2. it requires only a reduced number of cells per droplet (thus per experiment) allowing the application also to primary cells, including patient-derived samples, without need for intermediate culturing steps. We have applied this technology to identify combination therapies for pancreatic cancer, for which very limited therapeutic opportunities exist, in collaboration with Thorsten Cramer (Molecular Tumor Biology and Department of Surgery, RWTH Aachen University Hospital) (Eduati et al. Nature Communications, 2018). Yang, Mi, Jaak Simm, Chi Chung Lam, Pooya Zakeri, Gerard J. P. van Westen, Yves Moreau, and Julio Saez-Rodriguez. 2018. “Linking Drug Target and Pathway Activation for Effective Therapy Using Multi-Task Learning.” Scientific Reports, 8322 (2018) https://doi.org/10.1101/225573. Eduati, Federica, Lara M. Mangravite, Tao Wang, Hao Tang, J. Christopher Bare, Ruili Huang, Thea Norman, et al. 2015. “Prediction of Human Population Responses to Toxic Compounds by a Collaborative Competition.” Nature Biotechnology 33 (10): 1109. https://doi.org/10.1038/nbt1015-1109a. Iorio, Francesco, Theo A. Knijnenburg, Daniel J. Vis, Graham R. Bignell, Michael P. Menden, Michael Schubert, Nanne Aben, et al. 2016. 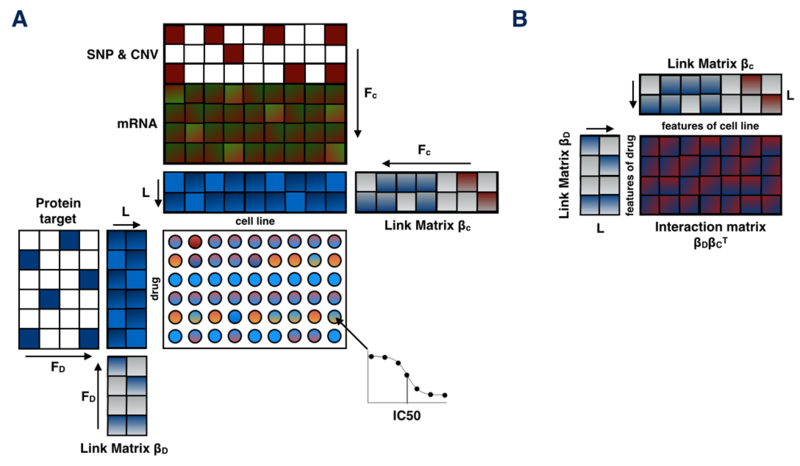 “A Landscape of Pharmacogenomic Interactions in Cancer.” Cell 166 (3): 740–54. https://doi.org/10.1016/j.cell.2016.06.017. Menden, Michael Patrick, Dennis Wang, Yuanfang Guan, Michael Mason, Bence Szalai, Krishna C. Bulusu, Thomas Yu, et al. n.d. “A Cancer Pharmacogenomic Screen Powering Crowd-Sourced Advancement of Drug Combination Prediction.” https://doi.org/10.1101/200451. Eduati, Federica, Ramesh Utharala, Dharanija Madhavan, Ulf Peter Neumann, Thomas Longerich, Thorsten Cramer, Julio Saez-Rodriguez, and Christoph A. Merten. 2018. 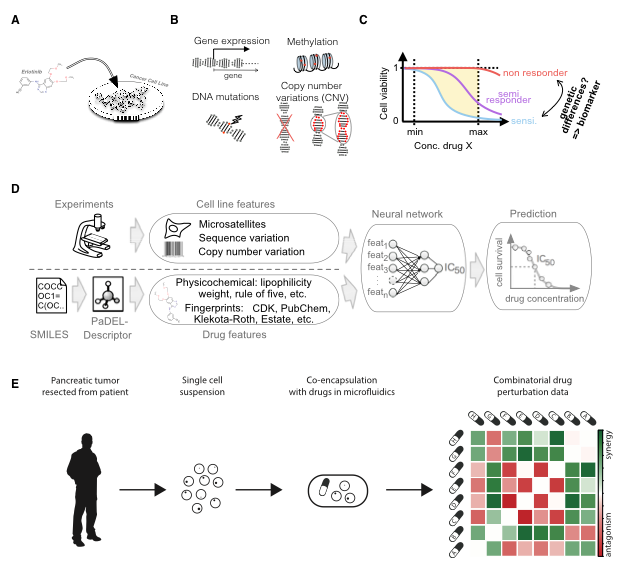 “A Microfluidics Platform for Combinatorial Drug Screening on Cancer Biopsies.” Nature Communications 9 (1): 2434. https://doi.org/10.1038/s41467-018-04919-w.